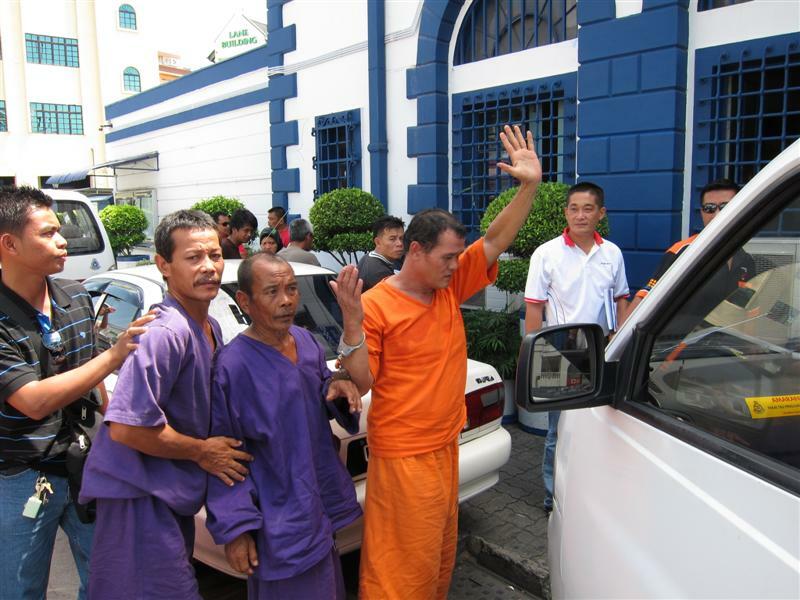 5 native villagers Papai Ak Atin, Barak Ak Kolol, Mani ak Marin, Karia Ak Daruh and Peter Ak Laiong of Kampung Mawang from Tebedu, Sarawak, are ordered by the Magistrate to be remanded at 4 different police stations in Kuching for 4 days and shall be produced in court on 18 May (next Wednesday) at 10.00am. According to the investigating officer, Insp Azlan, the 5 Bidayuh villagers are allegedly involved in the torching of workers quarters, bulldozers, tractors and other machinery at a timber camp on May 9. A police report was earlier lodged by a timber camp site manager Chen Teck Soon who estimated that the timber company is suffering a loss of RM5 million as a result of the fire. None of the 5 villagers was named in the police report but the police officer said that these 5 villagers are members of the joint village action committee formed to defend the NCR land and forests, that photographs and video footages taken at the blockading site showed that at least one amongst the 5 villagers had participated in the protest. The 5 villagers who were met by SADIA co-ordinator Encik Nicholas Mujah with his colleagues and a group of village folks at the Central Police Station, said that they had received a notice from the police in the evening of 12 May requesting them to go to the Tebedu police station at 9.00am the next day. Upon arriving at the Tebedu police station, the 5 villagers were brought to Serian police station and onwards separately to Sekama, Tabuan Jaya, Sg Maong and Gita police stations in Kuching and were detained for the night. No statement was recorded from any of them yet. See Chee How, who was representing the 5 villagers together with his fellow lawyer Desmond Kho, said that the villagers had lodged numerous police reports on the encroachment of native customary rights land by the timber company but the complaints were apparently not taken up seriously. When the villagers brought up the matter with their state assembly representatives and state Infrastructure Development and Communications Minister Datuk Michael Manyin Jawong, the minister was reported as saying that the villagers had been protesting for more compensation money. “Any dispute or confrontation could have been avoided if the police and the relevant authorities have looked into the complaints and take necessary actions,” said See, the newly elected Batu Lintang State Assemblyman. I agree with Sis Christina, where’re our Dayak’s leaders when our Dayak people NCR land are being encroached by these animally Taibetes group of gangs. It’s our Dayaks n our Malays ourselves to be blamed for still blindly giving PBB/UMNO/BN n the Taibetes to return to power after PRN13. Just less then 3 weeks after the PRN13 they already started their intrusion into our NCR land in Tebedu. Just wait, there’ll be more intrusions in months to come. These’s what S’wakian as a mass wanting to see n undergoing. Who’re there to help u all. It’s still the few PKR leaders alike Sdra. See Chee How, Sdra Baru Bian, Sdra. Paul Rajah, Sdra. Ali Basah, Sdra. John Antau n a few others alike Sdra. Christoper, Sdra. Mashor, Sdra. Mujah, Sdra. Mengga n many more enable to mention all. Where are the Dayaks leaders in PBB/PRS/SPDP. They’re all lembu dicucuk hidunglah. Tak ada bijilah. Kalaupun ada biji hanya biji engkabang aje dibawa ke mana ke mari utk tipu org2 Dayak esp our Dayak in Layar. Let’s all brothers n sisters in PR work harder to topple UMNO/BN in Putra Jaya in PRU13. May God Allah bless us all. A lesson to timber company and BN YB.Bidayuh villagers now has show their rights.No need again to be dumb or being blinded citizen.A brave move by the 5 vilaggers.We will be 100% support you all! Like Christina had said, don’t just talk about giving support when you are a coward yourself. You just want to instigate others for your own benefits. That’s what happen to many of our people today. These 5 villagers had been played out. They had been used by instigators and acted foolishly. For once, if everyone take the law in their own hands, the results are detrimental. Who will suffer? It is the once peaceful villagers who will face the music. When law and order is replaced by chaos and lawlessness, everything will go out of control. The society and the country ran into turmoil. It is also the rakyat that will suffer. Let’s look back into history and the chaotic situations happening in countries around us every day. We are peace loving citizens and we want to protect the harmony of the people. We do not want war and blood sheds. Taking up arms and resorting to riots and violence is not the answer to problems. Instead it creates disunity that bring forth calamity. The 5 villagers are just victims of instigation and were made to believe that they are heroes. They are NOT. They are scape goats. Another poor victims is the developer. Today village headmen are NOT stupid or illiterate. They are well-informed and knowledgeable. The developer spent much effort, time and money trying to earn a living in this very corrupted government. So if the villagers are to retaliate, they should pinpoint the villains.. it is DEFIITELY NOT the developers. The ignorance of the Village Headmen are questionable. Their integrity are put to the test. The authorities are answerable. Taib government should be put on the chopping board. Not the developers. So act with your brains, not your temper. Calling all Dayaks, concerned citiens, civil societies and NGOs to demonstrate outside the court house on May 18 (Wednesday) and thereafter march to the DUN to demand justice for all aggrieved NCR land owners who were merely defending their ancestral lands from been trampled upon by Taib’s cronies. Calling all Dayaks? What a crap! Did you go to MAR ro Jupiter during last election? Otherwise you should have known that the DAYAK are the one who put BN back to power….so they asked for it! Dindnt the Bidayuh voted for Manyin….with very good majority? Good luck! I called Dayaks to show up at my brother’s appearance at High Court on May 10th. Only a handful of my relatives and Nicholas Mujah showed up. You think Dayaks care? Somebody or some organisations need to provide transport to bring these Dayaks to the town. A little support goes a long way. When you are dirt poor saving RM10 is big deal for the farmers and rural poor. If you want results, get organised and spend money for transport and food to get them to the Court or DUN. Been there, done that! Collected mostly from friends and relatives. Very few Dayaks contributed and one Indian guy contributed 10 thousand ringgits. We had and are going to use the money for transportation, food and lodging for rural relatives to Kuching for the civil suit against Quality Concrete Holdings and State Government of Sarawak on August 8th this year! So, where are the educated Dayak lawyers, the ones who said “Ngap Syop” or “Agi Idup Agi Ngelaban”. Why are you quiet huh? Scared kah? Come election time you all want to contest and want people’s support. Now where are all of you? Why is that only Chinese lawyers who dare to represent the Dayaks? Now you talking Christina! All this while the Dayak….especially the Iban. If the Iban do have a brain as the size of a peanut; I am sure they will do something to change the situation back then…..to bad most them think with their “kepala lutut” or with their “dickhead”! Only now you know tht S’wakian are oppress you dickhead! I’m sad when you guys bring God into this matter. He had done so much for you guys but all you guys do is drink tuak & langkau & get drunk .. go Church only when it is celebration.. dressing up like u r going to some rock concert when going to Church. What happen to Keeping Sabbath Only and partaking of the Holy Sacrament every Sunday? The issuance of timber concession areas and licences to extract the timber seem to so easy to some. Are you telling us the government make easy job can plot any greenland based on the Google Map and have it commissioned to the proxies. Why there no proper ground survey being carried out at the first place to determine any rights claim to be based on the Native Customary Rights/Reserves? How come there is no public notification to announce for any file-in claims. Why there being no open tender to harvest the timber? What is job of the NREB? Are the STIDC, Harwood, Forest Corp. and Archipelago closely-linked each other to deny the many qualified forest professionals who taught to adhere good forest extraction, production and management practices. Why such crude timber extractions are still in reckless practices today? Landowners in urban/suburban areas with their expired leases can now get renewed after a good fight. Will NCR landowners be considered to make their claims thereafter all the timbers are totaly extracted from these prospective tracts of hereditary land. The rings on the tree trunk can determine your aki, aki-aki ages. These trees belong to our forefathers. Why can’t the landowners be granted with a licence to extract timber then subject to the approved levies/royalties. Who do not know timber is MONEY? C’mon to all those affect Tebedians may be it is right for the time being setup your farmlands on Manyin’s estate. Guess what’s the reaction! See Chee How!! !Go and fight for these guys!! Why call on we Chinese to fight for you when u are taking the law in your own hard. Why not continue to burn and plunder more properties belonging to the innocent party? Where are your Dayaks leader? Why haven’t they stand in the front line to defend the rights of Dayaks which you have promulgated? Yet you guys blindly gave them (the BN cronies) your vote. Yet you claimed that the developer are BN cronies..how ironic!! So wake up from this insanity and for once, come to your senses and DON’T ACT IRRATIONALLY. We are civilised people.